Firstly, the country rejected Theresa May’s vision of a low-tax, small-state Hard Brexit Britain. Secondly, Jeremy Corbyn’s Labour Party saw its share of the vote rise by more than ten percentage points on the result of May 2015, just two years ago. This is a remarkable result, defying the expectations of the press, the pundits, and many of the the leadership’s own supporters. Beyond that, what just happened and what it means is murky, and lies behind the headlines. Before working out what the result means for Labour, we need to start with what happened. Who voted Labour and why? And — if you believe Labour should be a party of government — how far does that leave the party from power? The General Election’s exit poll — run jointly by Sky, the BBC and ITV — is likely to be the most accurate of the campaign in showing what lies beneath both because voters were questioned at polling stations immediately after voting, and also in terms of its sample size. However, we will not get the full details of what it shows — cut by age, geography, prior voting intention, income, and other useful information — for at least a couple of weeks. In the meantime, from the evidence we have, the following seems possible to tell about what happened with the Labour Party and on the left. This one is pretty simple and not entirely unexpected. The ‘left’ of politics that sat outside Labour – the Green Party and other far-left alternatives saw their vote collapse. This added about three percentage points to Labour’s vote. In addition, Labour picked up votes from the Lib Dems. This could be due to the party’s message and leadership, or due to tactical voting, or some combination of both. This added about another three percentage points to Labour’s vote. Whilst we wont be sure until the full exit poll data is released, there is a range of evidence to suggest that young people fulfilled their promise to vote in larger numbers that ever before, and did so overwhelming for Labour. These are voters who often voted for the first time at the EU referendum, voted strongly to remain, and retain that view – alongside the voting habit. Labour’s manifesto appealed to them – including the promise on tuition fees – and the Labour Party and its outriders fought a campaign which had verve and motivated them to vote for Labour. Nationally, turnout only rose two percentage points on General Election 2015— to 68.7%. We don’t yet have a clear idea of who these first time voters were but its likely they are weighed towards the young. However the turnout was not as high as some were predicting or had hoped for. Almost one third of registered voters still did not vote. This turnout takes us back to close to general election turnout last seen in 1997, but behind the EU referendum turnout of 72%. So, whilst for some people the referendum signaled the start of a habit of voting, for others it has not. A large number of voters who previously voted UKIP voted Labour at this election. They were largely older, white, working class and live outside of major cities. It would be surprising if they didn’t still want Brexit to happen. These ex-UKIP voters will largely be socially conservative, and uncomfortable with change. Working out why these voters returned to Labour is crucial – do they think Brexit is a done deal and so were happy to return to former voting habits? Or was their Brexit vote actually more a protest against austerity and the way the country is run than a vote for Brexit itself? In Scotland, whilst Labour’s vote only went up by just under three percentage points on 2015, a Conservative surge taking votes from the SNP brought six new MPs to Labour. With SNP’s record in government finally coming home to roost, this is one area where there are clearly fertile soils for Labour in elections to come. Labour’s voters were the most split over Brexit – and included hard leavers, hard remainers, and soft remainers in their ranks. Keir Starmer hit different notes to Jeremy Corbyn on Brexit during the campaign. It may be that this ambivalent position worked in Labour’s favour, meaning both remain and leave supporters heard messages they liked or would accepted from Labour. Whether the inherent contradictions in the views of this is coalition of voters can be taped over or moved beyond is a key question for Labour in the months and years to come. The polls during the campaign suggested that there are a good number people who planned to vote Labour despite Corbyn rather than because of him. They did this because they supported their local Labour MP, or because they wanted a strong opposition to the Tories, or for a range of other reasons. It is fair to assume that a number of these did this feeling safe in the assumption that we would not wake up with a Labour government on June 9th. Therefore a further key question for Labour is whether the Party can hold onto these votes at a future election if these people regarded Labour as a genuine potential party of government. At this election Labour’s share of the overall rose from 30.5% in 2015 to 40% — an increase of 9.5 percentage points. The Tories vote rose from 36.9% to 42.4% — an increase of 5.5 percentage points. However Labour continues to have more than 50 seats less than the Conservatives — 262 compared to 318. It is a country divided, but — unlike what we saw in the 2005 general election — divided in a way that favours the Conservatives. It would be easy to say that that means the voting system is unfair on Labour. However, the Labour Party is a creature of our current voting system. At this election, as in all elections past, Labour built a coalition of voters with different interests – in 2017 this coalition generally overlapped on the value of the NHS, of the importance good public services, in opposing austerity, and in favouring a redistributive tax system. However, as we have seen, this coalition of voters also disagrees on an equally wide range of issues, including Brexit, and over culture and immigration. The coalition ranges from those who would like a fully socialist economy to traditional social democrats. If we were in Germany or Spain, or Sweden – or any country with proportional electoral system — there is no way that this coalition of voters would all vote for the same party. 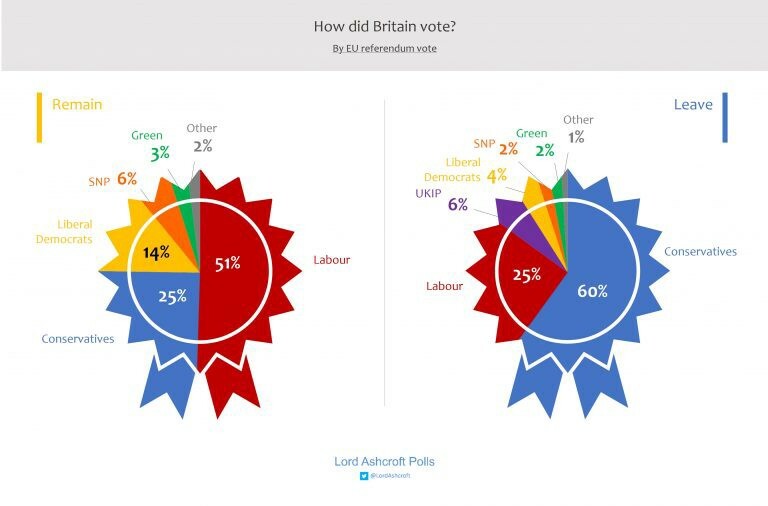 This coalition of voters is the result of the first past the post electoral system that we have in the UK. It’s important to bear that in mind when considering where Labour heads next. Where does that leave Labour? Labour remains out of government. Sooner or later, the party will face another election – and, it may be sooner than we’d like. In order to become a government, the party needs to find more voters than voted for the Labour last Thursday. In doing that it faces a range of challenges. It faces a massive generational split – with those over 65 extremely like to vote Tory, and those between 18 and 34 extremely likely to vote Labour. Of those that voted Labour this time, there are — as we’ve seen — big differences in opinion within that coalition of voters. Labour also faces a mammoth Conservative vote share — the same percentage as the Conservatives received at the 1983 General Election when they won 397 seats. In order to get a majority in parliament, Labour needs to find a way to win about 60 more seats. And if the party wants a working majority Labour needs to win in seats like Redditch — which, on a straight swing, would be about number 100 on the target list. Redditch, just south of Birmingham, is a seat which had a Labour MP until 2010, where the NHS hospital is seeing death by a thousand cuts, and which is far from a wealthy place. On Thursday, it voted in a Tory MP – a candidate who had no previous connection to the town standing against a Labour candidate who lives in the area and has been a local councillor – with a 7363 majority. Be under no illusions of the size of the mountain left for Labour to climb. During the 2015 Labour leadership election it was highlighted out that there were not enough left of centre voters to win a majority. This election has not changed that, but those left of centre voters have consolidated under Labour. The party does not have much more — if anything — it can squeeze out of the Greens and Lib Dems in the areas where it needs to win seats. Outside of Scotland, there is realistically almost no existing voters left to win over who shares Labour’s core left of centre world view. 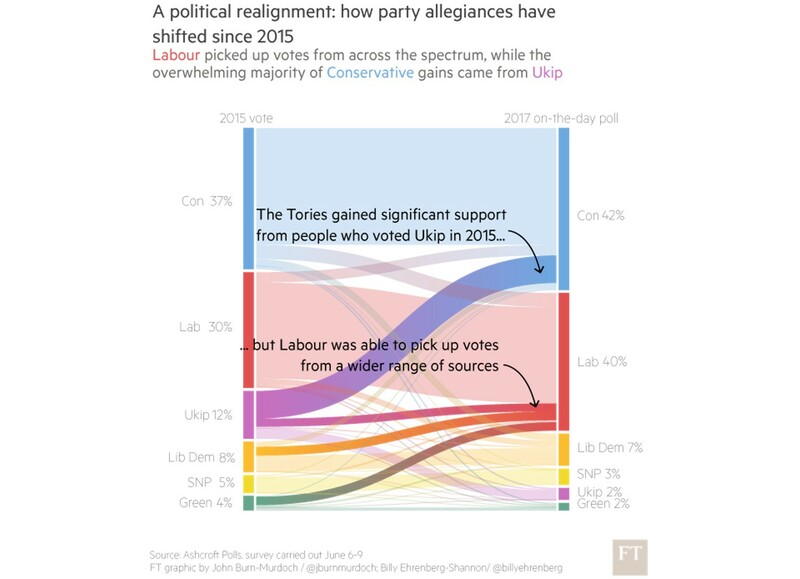 The party has also worked hard on increasing the number of people who vote — whilst it is not impossible that turnout might increase further, it is unlikely to increase enough to change things materially. Therefore — sadly — this leaves the Party back with the question we were asking at the 2015 leadership election — how does Labour win over enough people who currently vote Tory to put Labour into power? There may well be answers to that that the new politics has which the old one didn’t, but that remains the core electoral question facing Labour if it wants to be a party of government.